Part of my New Years Resolutions was to be more consistent with blogging this year. I wanted to get myself on a schedule so that not only me, but my readers, would know what to expect from me each day. I also want to have more of a variety of what I post about and so I think that this will help me stick to that. When I was home in NY last week, a couple people commented to me that there hasn't been many recipes over here lately... So I'm going to try and make an effort to get my bum in the kitchen and get some new recipes for you guys. I recently signed up with Blue Apron (they mail your weekly dinner groceries to your house! ), and I'm hoping to share some of those delicious recipes with you soon! I also mentioned that I wanted to start a YouTube channel. I have a few blog collaborations coming up with some companies that wanted me to try some beauty products out for them. I don't know how much I'll really stick to the once a week thing on this... but if there is a new product that I'm trying out, I'll be doing a "first impression" video which I'll post here. Wednesday's will be outfit posts. I hope to be able to continue to show you how to wear one piece of clothing, styled multiple ways. This will also be the designated day in which clothing sponsors will be showcased. I've been wanting to be more crafty, and my DIY project board on pinterest is getting out of control, so I'm hoping to be able to show some fun, and easy projects with you all this year! Also, I'm leaning more and more towards homeschooling for Jay and Em when the time comes (my preferred option would be a dual enrollment program, but that's a post for another day...), I mentioned over the summer how I wanted to do an at home preschool for Jay but then the whole pregnancy thing happened and that didn't. I'm hoping to revamp that this year, and show you some of the things we're working on! Friday's will be Five Things Friday, where I'll be talking about 5 things that really made the last week great! 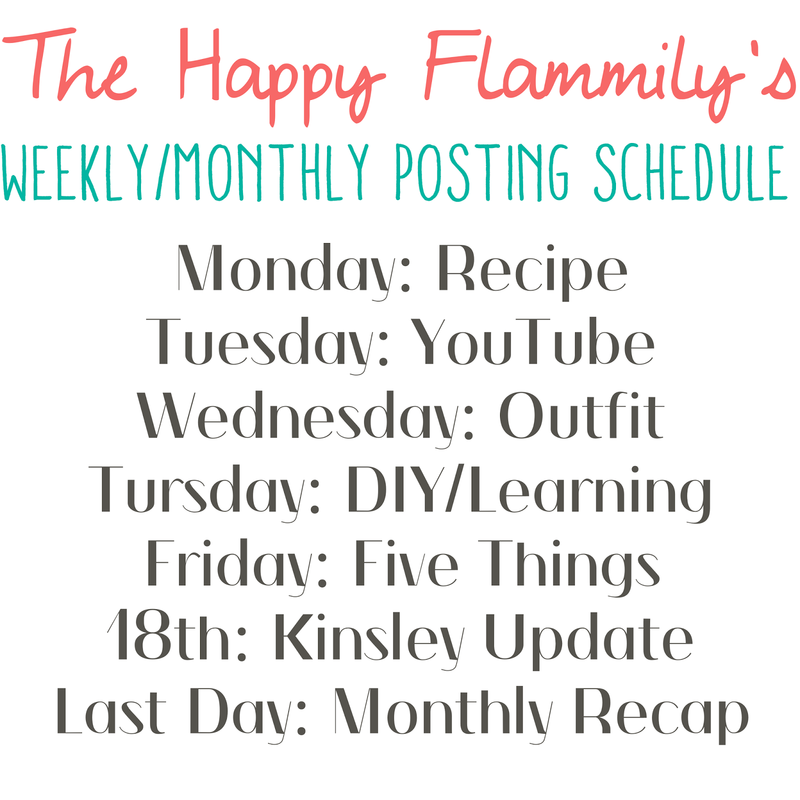 The 18th will be a monthly Kisnley update, and the last day of the month will be a little recap of the last month of our lives! Hopefully this isn't too overwhelming for people reading this blog, but I think this structure will be good for me to stay organized with getting posts out to you guys more consistently! Of course this could get tweaked a little bit here and there depending on the week and if certain sponsor's need things posted on certain days... but I'm going to try to stick to this as best as possible! Yeah!! I am so glad you want to blog more. I missed your posts during your break from blogging world. I am especially thrilled for your outfit posts and glad you decided to do them again. I love your style and you give me great outfit ideas. I love your posts so YAY YAY YAY YAY YAY! I need to make a schedule for myself too, but it hasn't happened yet. I wish I could blog in my sleep. lol. Then all the words and ideas in this head of mine would make it out to the world.